Student B analyzed twenty speeches by civil rights and women’s rights activists, measuring how different speakers use certain words that indicate a focus on self (I, me), a focus on others (they, them), a focus on the past (had, was, were, et al. ), or a focus on the future (will, should, would, could). Student B created ratios of uses of certain pronouns against all pronouns used, and through this developed a sense of the focus of different civil rights and women’s rights activists. This shows Elizabeth Warren’s focus first on “they” (the 3rd person plural), then “we”… and so on. This small sample reveals a greater focus on the first person plural, or a sense of togetherness. Student C assessed consonance and assonance in rap lyrics by quantifying the appearances of every phoneme in the lyrics of select rap artists/songs. Songs were analyzed both for overall phonetic distribution and for the size and frequency of phonetic repetition. Student D compared the writings of Robespierre to the writings of his critics by comparing co-occurrences of words in each aggregate body of writing. What words also appear in sentences that contain the word “virtue”? On the left are co-occurrences in Robespierre’s writing. On the right are co-occurrences in the writings of a selection of academic critics. Student E assessed the full text of Donald Trump’s Wikipedia page on specific days in its edit history: the day before Trump announced his candidacy, the day before winning the Republican primary, and other key dates leading up his 100th day in office. What words were added to Donald Trump’s Wikipedia page between the time of his presidential campaign announcement and Spring, 2017? Student F filtered names from the King James Bible and generated social network graphs based on name adjacency. The resulting graphs offered a visual representation of centrality of different figures in each book of the Old and New Testaments. 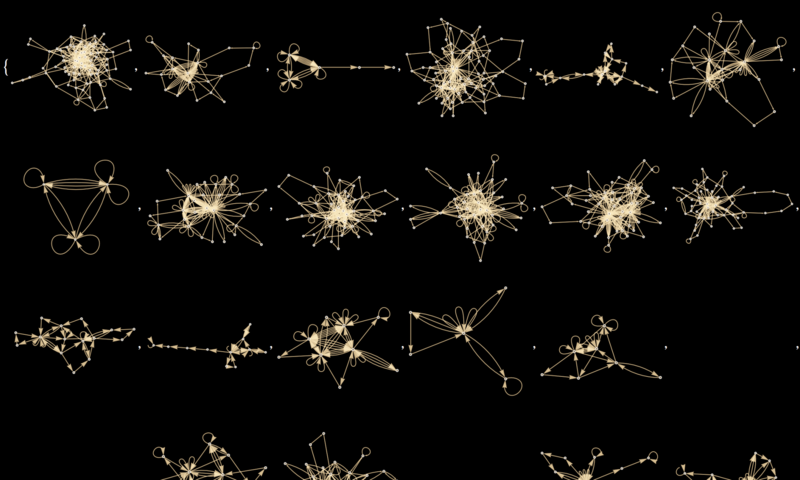 Network graphs of the first five books of the New Testament, based on name adjacency and without names that appeared only once. Student A analyzed sentence complexity in four different subsets of his high school writing: 9th grade, 10th grade, 11th grade, and his college essays. He used adjacency matrices and closeness centrality to calculate complexity. The results were not conclusive, but opened further possibilities for study. Student G assessed word frequencies in the lyrics of every album released by the Beatles, seeking to understand what subject matter changed, what subject matter persisted, and how each album was distinct from the other. What words appear only in the album Abbey Road and not in any other Beatles album? Student A (again) identified place names in Tolstoy’s novel and graphed them by chapter, resulting in a visual representation of the shift of geographic imagination and attention over the course of the novel. For more details about what is required for each project, see the Syllabus page.